I have been adding to this list for awhile now. It’s not that I don’t really love my life, but sometimes? 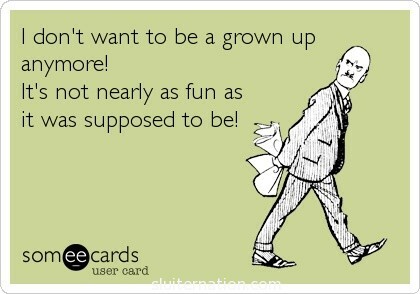 Being a grown-up stinks. Bad. body parts that just hurt because you’re getting older, not because you injured it doing some daring stunt like crowd surfing. Cleaning the bathroom that other people make gross. I’m looking at you, Charlie. AIM YOUR PEE. Doing other people’s laundry. Again, Charlie, I’m looking at you. WIPE YOUR BOOTY BETTER. Worrying about how long the grass is. Being exhausted…by just being awake. Kidz Bop being part of my life. Paying over $100 every 6-8 weeks to cover grey hair and remove other hair. Understanding why Garfield hates Mondays. Being in charge…all the dang time. the practice of herding cats…all day, every day. The lack of nap time. Being the bearer of bad news. people you love start dying. Having to explain hard stuff to innocent people. Having to let your kids win at games once in awhile. Picking up after other people. Caring about things that with letters and numbers as their names: 401K, 403b, LMNOP3 (ok that last one is not real, but whatever). Having to talk about budgets. Spending all that money-you-don’t-have-but-wish-you-did-so-you-could-spend-on-fun-things on fixing a 30+ year old lawn mower’s steering. Knowing there is no quick fix, silver bullet, and maybe not even a happy ending. Having to follow through with consequences that leave you without fun. Seeing your childhood through “adult eyes.” That thing that was so big and amazing? It’s really just normal…and kind of run down. Being able to relate to Cathy and her reaction of “ACK!” to everything. Having to do social stuff when you don’t want to do social stuff, but it’s sort of required social stuff, so you do it anyway. Getting AARP mailings…when you’re not even forty. I realize not everyone has the same experience as I do. Some people never have kids and are still jumping out of airplanes at ninety years old. That is not the life I chose for myself. This list is not meant to be a big fat downer on my life, either. I really do love my husband and kids and life, but seriously. Sometimes things stink. So I made a list. What would you add? Let’s vent, shall we? And the part about seeing childhood things through adult eyes and realizing they’re not that great made me smile, nod, frown. My sweet husband thinks EVERYTHING about his childhood was amazing. This is a blessing and a curse. He is a wonderful father who wants for his kids/family all the beauty he remembers from his own youth. As his wife, I find this sometimes daunting (impossible) to recreate. It’s not a BAD thing. It’s just reality. He wants the memory of something that never really existed. Luckily, he has three sisters with slightly more “accurate” memories to keep him in check.